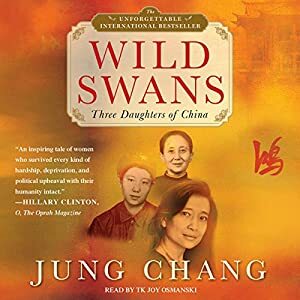 Wild Swans is the memior of Jung Chang’s childhood in China during the Cultural Revolution, but it’s not only about her. She begins with the story of her grandmother. Jung Chang’s grandmother was a concubine to a warlord. She had to use charm and wit to keep herself safe from being held prisoner by the warlord’s family – as she was considered the property of the warlord and of his legitimate wives. Upon her warlord’s death, she made the very difficult decision to marry, which caused many problems for her, her new husband, and potentially her afterlife (in which her husband and warlord would cut her in half to share her). This story delves into great detail about the strife that Jung Chang’s grandmother had to overcome. Now that I’m familiar with how foot binding works I will shudder every time I hear mention of it. I never realized…. The next section of the book is about Jung Chang’s mother, who grew up mainly during the strife between her mother and her stepfather’s family. WWII was also raging, which meant occupation and brutalization by the Japanese. (This was the most difficult section for me to read.) Once the Japanese occupation ended, their country was ruled by tyranny, thus bringing on the communist uprising. Jung Chang’s mother became deeply involved in the Communist Party while very young, but felt betrayed by The Party by the time she was pregnant with her first child. The final section talks about Jung Chang’s childhood, watching the Communist Party emotionally and physically torture those around her, including her parents. She vividly portrays the original innocence that she had – believing in the communist party and Mao’s propaganda. Slowly, gently, she began to emerge from this innocence. More gracefully than would be expected, given what was going on around her. That speaks to the power of Mao’s campaign. This was a fascinating and beautifully written book. It’s written lovingly, yet it’s brutally honest. The research is so amazing that every once in a while I wondered “how does she know that?” Her years’ worth of research definitely paid off. This book deserves the fantastic worldwide sales that it has received. I am tempted to read Jung Chang’s biography of Mao pretty soon. It was such an incredible read that added so much detail and depth to my own Chinese experience. It certainly was an incredible read. It (and the Pearl S. Buck series starting with The Good Earth) has made me interested in reading more about relatively recent Chinese history. There's a Great Courses course on sale at Audible about the decline and rise of China which sounds fascinating. I have had this book on my shelf for years! You just reminded me how much I want to read it… thanks! 🙂 I hope you enjoy it when you read it! Wow, what a story! I have a hard time believing it's nonfiction, because it sounds so eventful. Yeah, it is a little hard to believe, but I don't really worry about that whole “is the story exactly true” thing. I mean, such a hullabaloo about Little House on the Prairie, A Million Little Pieces, Roots, etc. Makes me laugh.